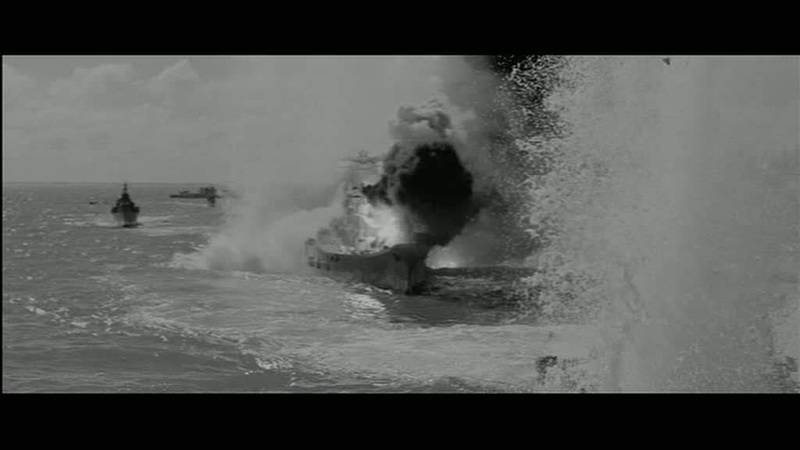 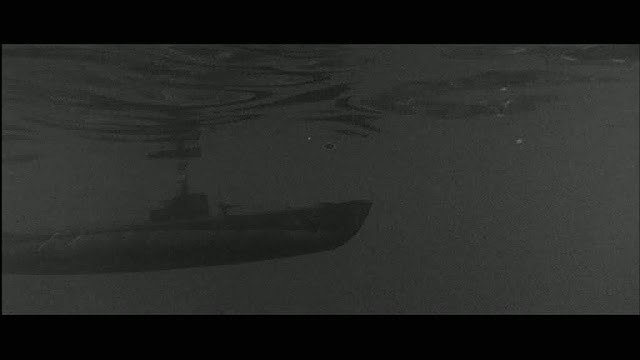 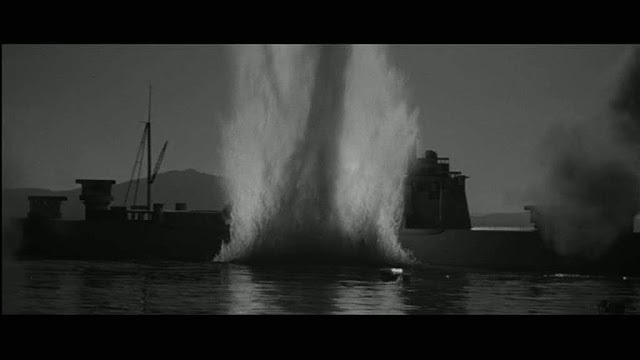 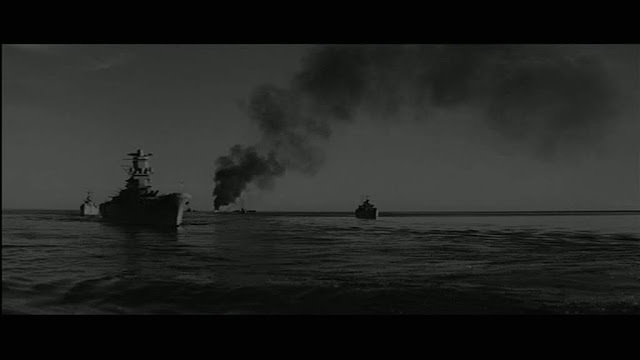 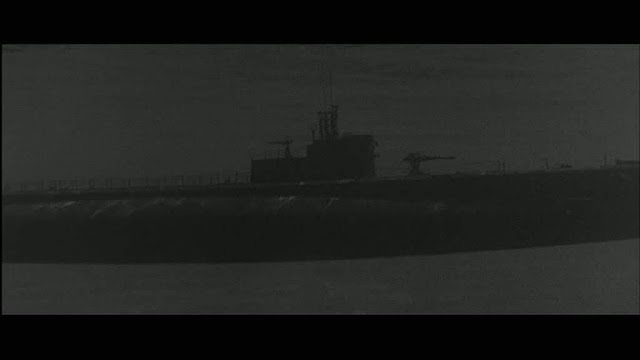 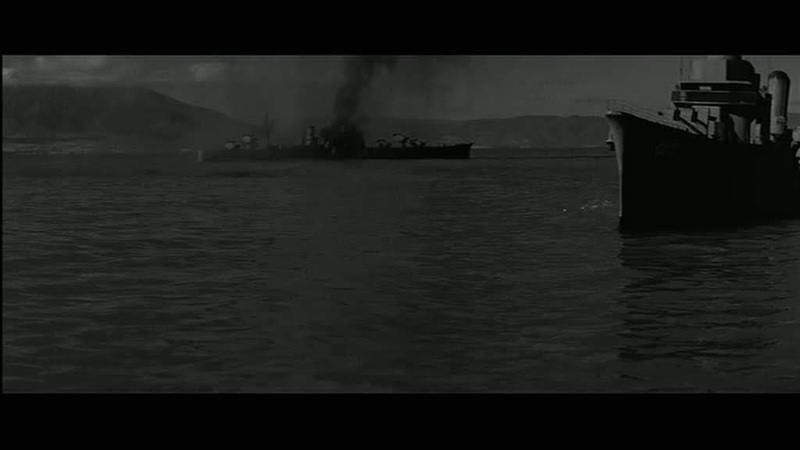 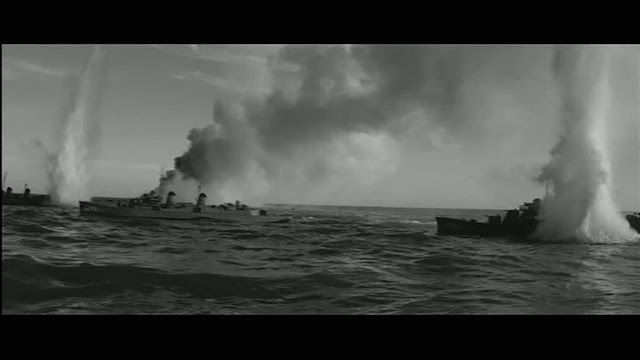 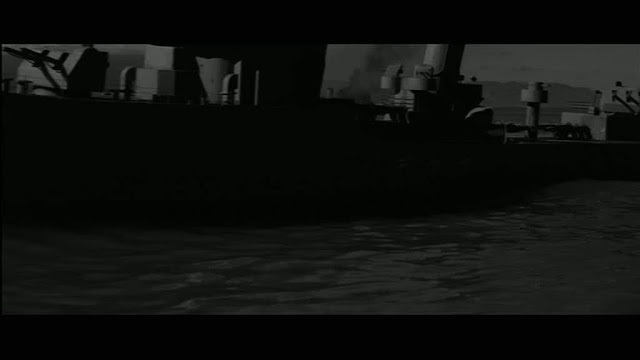 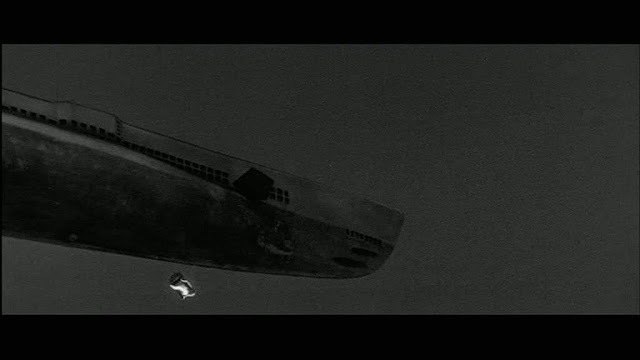 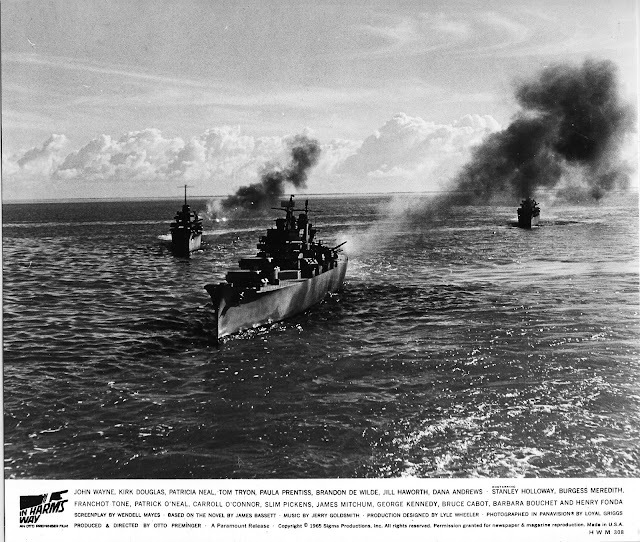 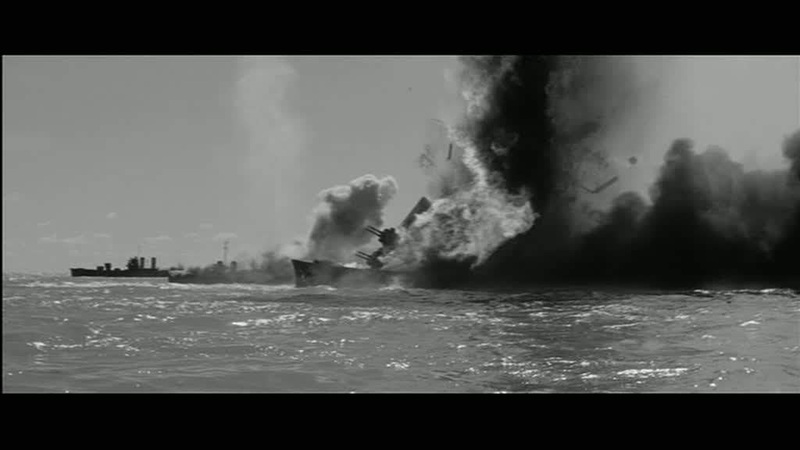 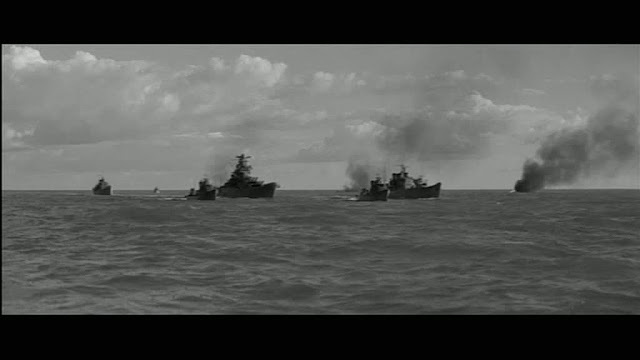 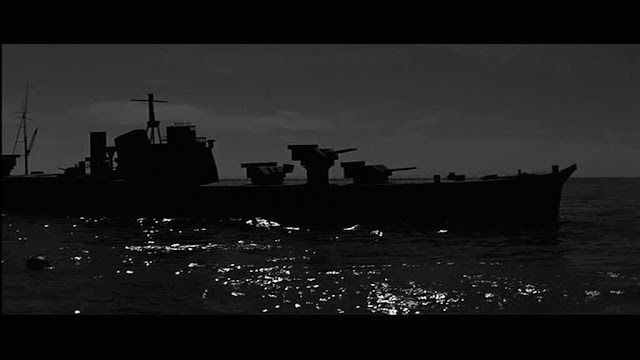 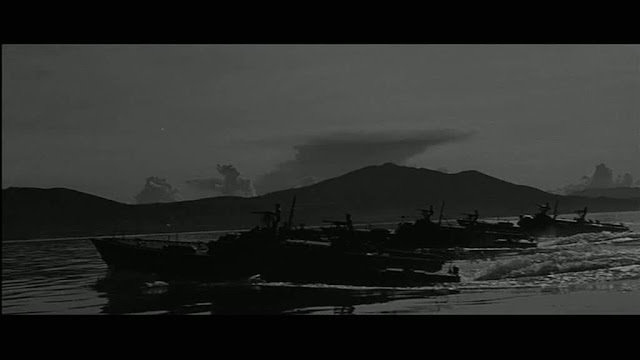 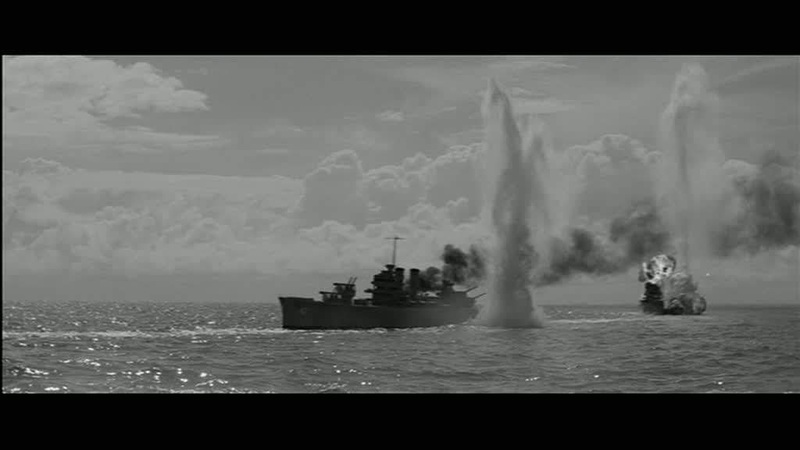 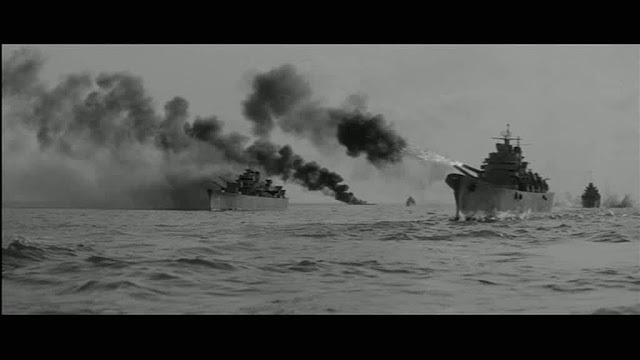 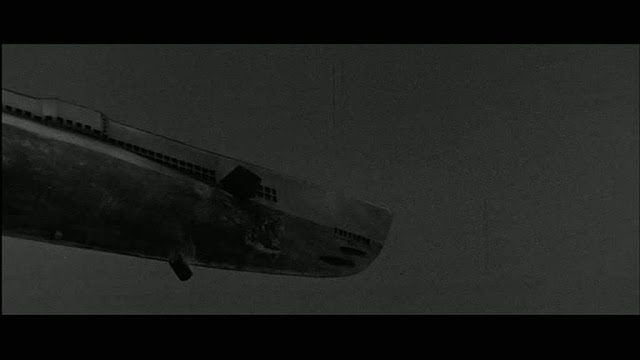 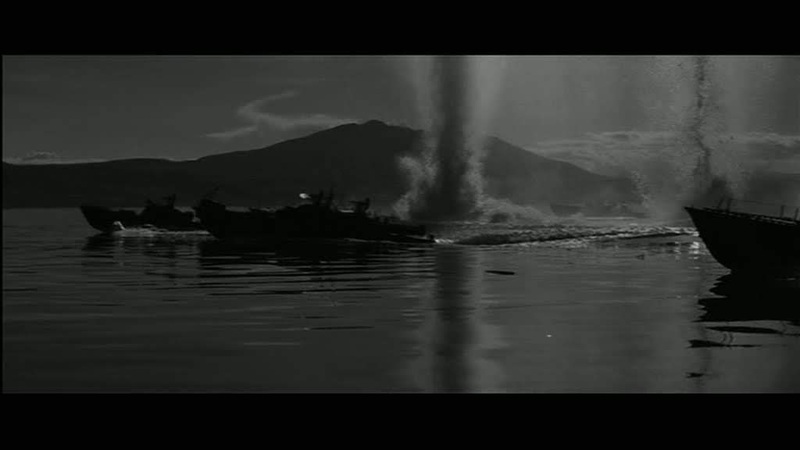 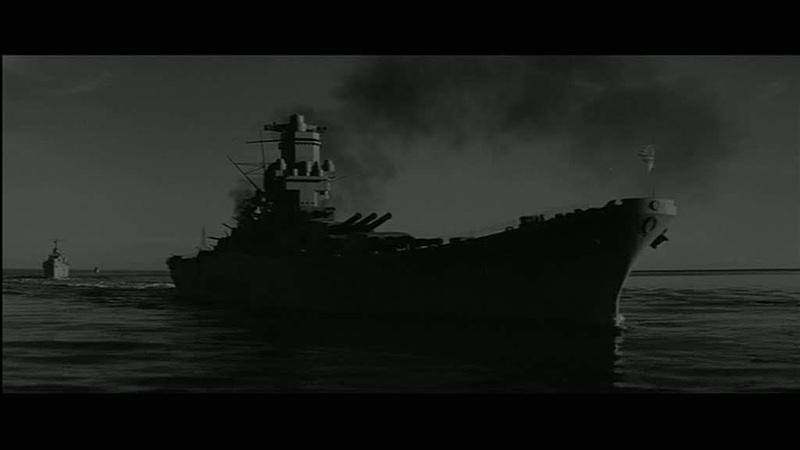 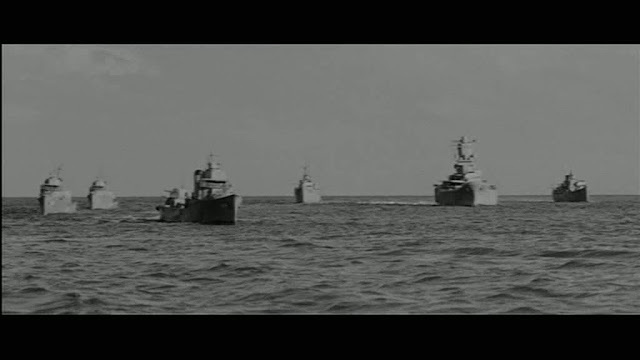 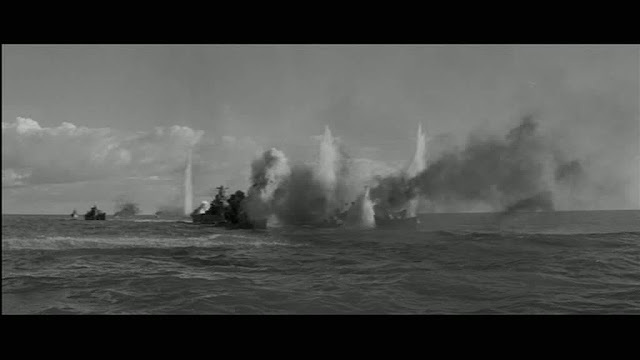 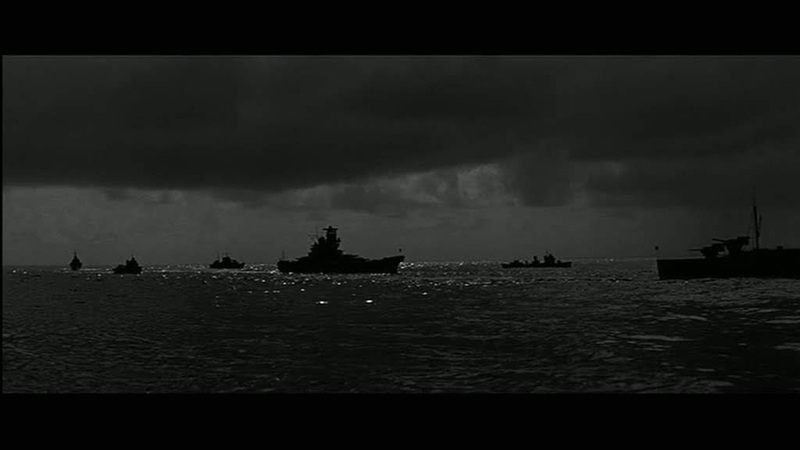 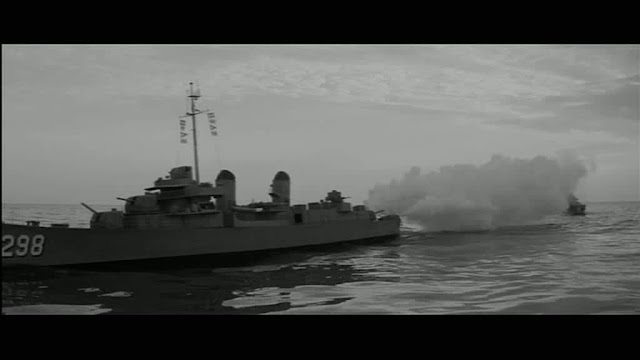 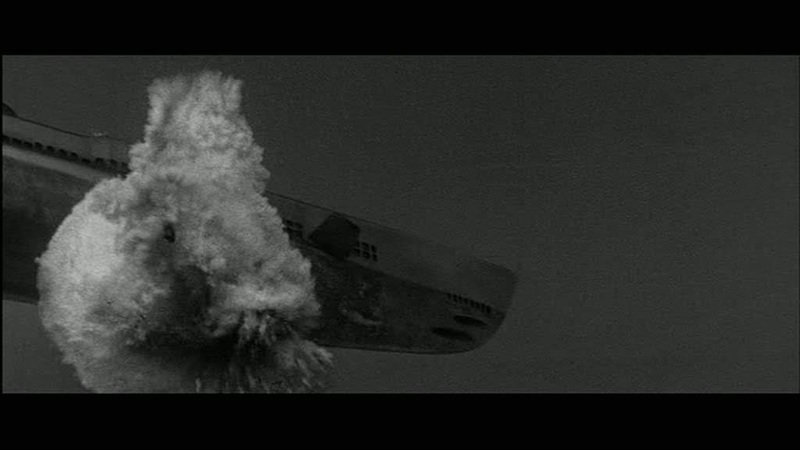 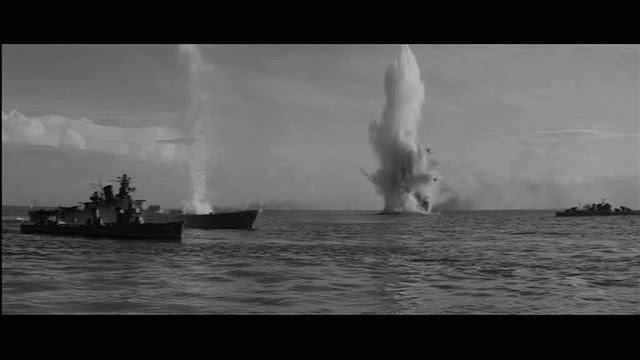 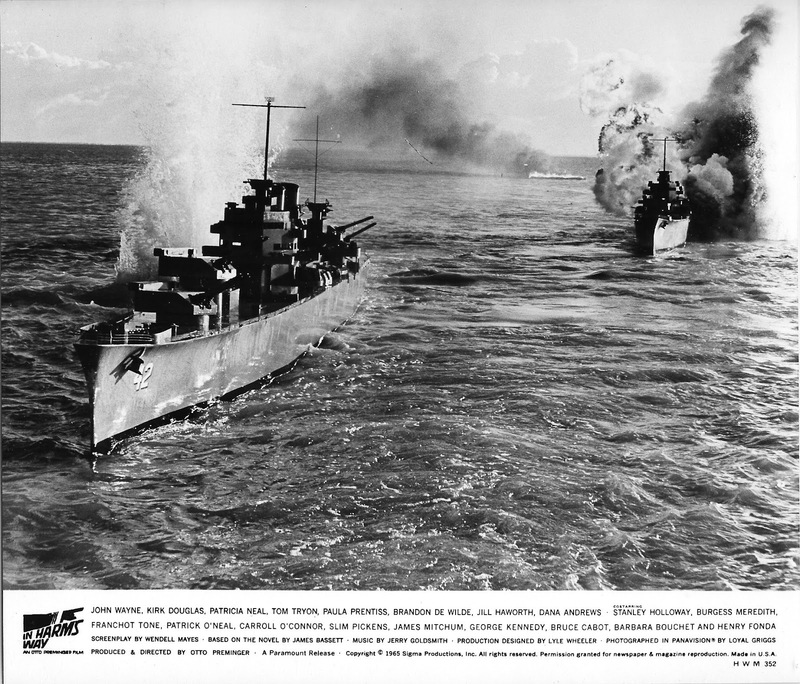 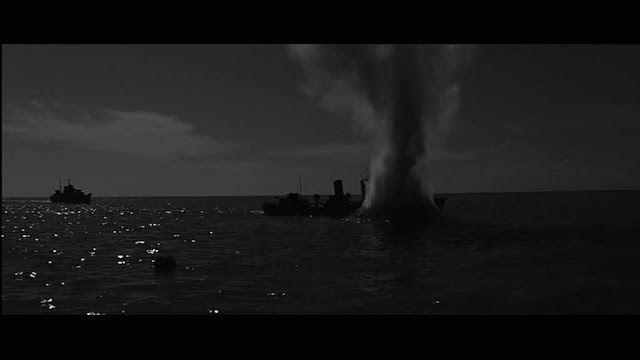 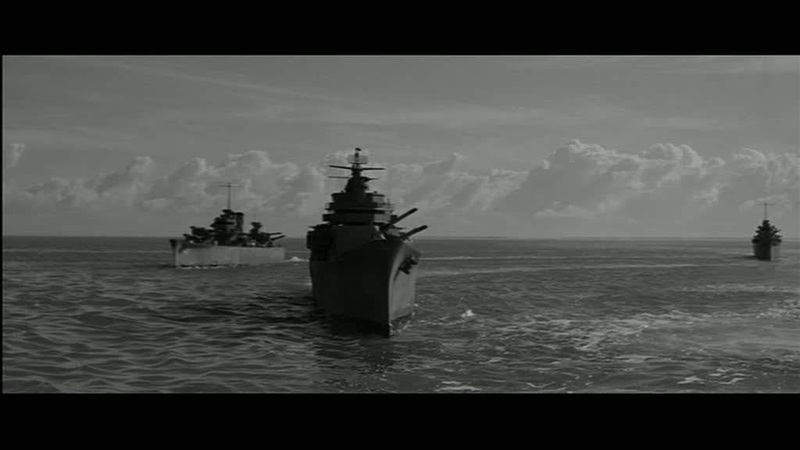 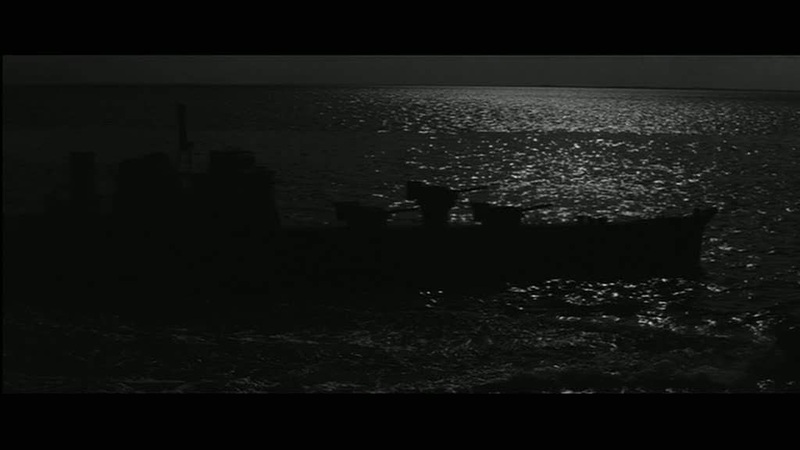 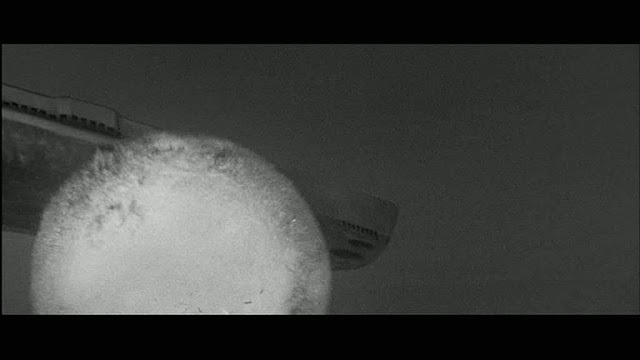 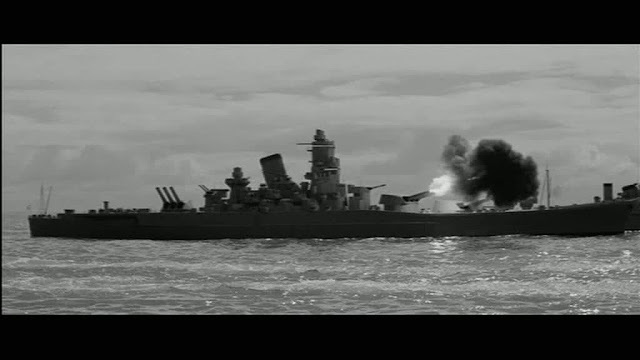 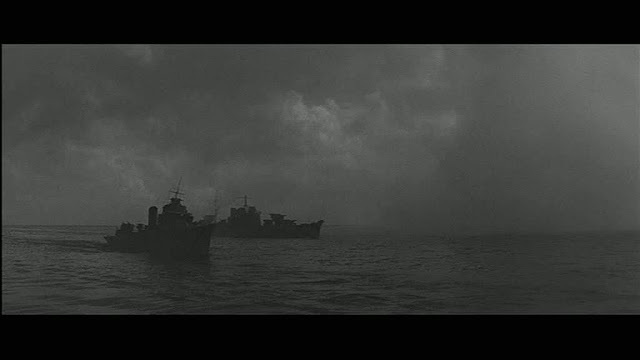 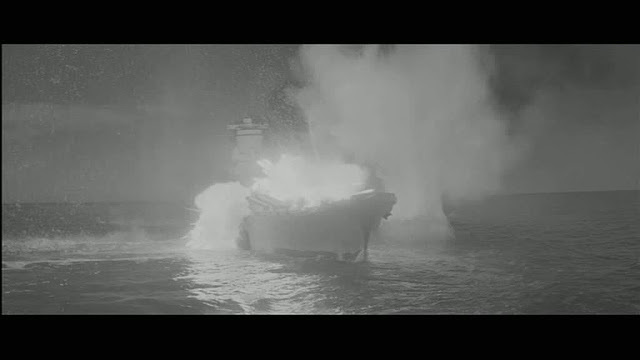 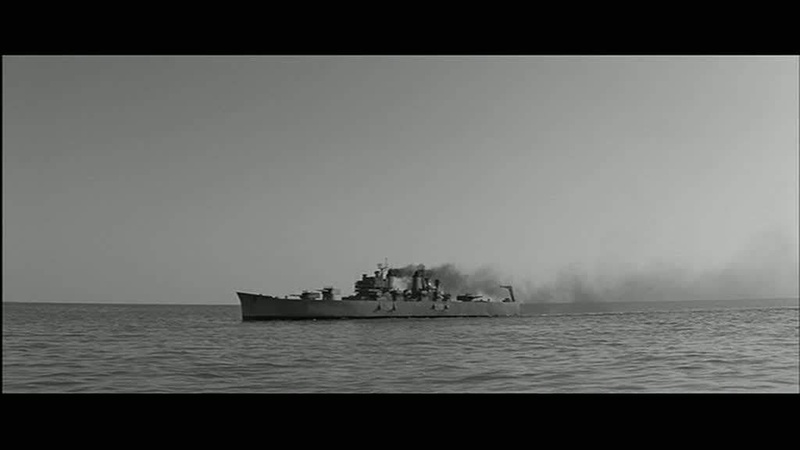 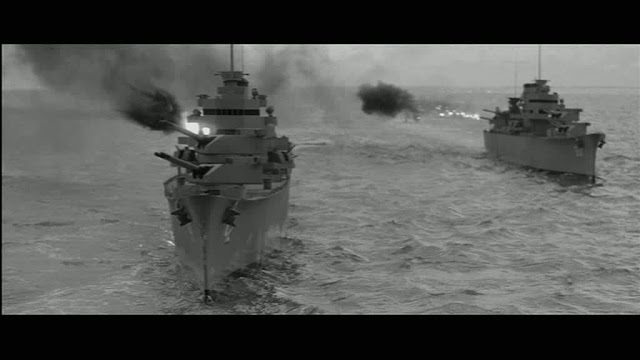 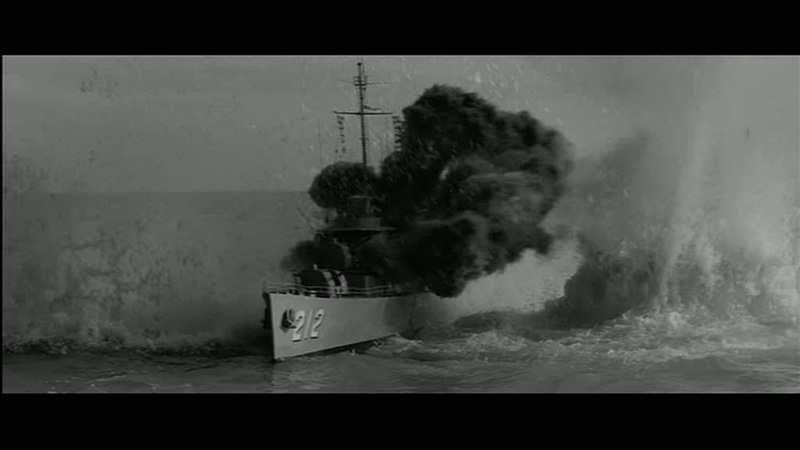 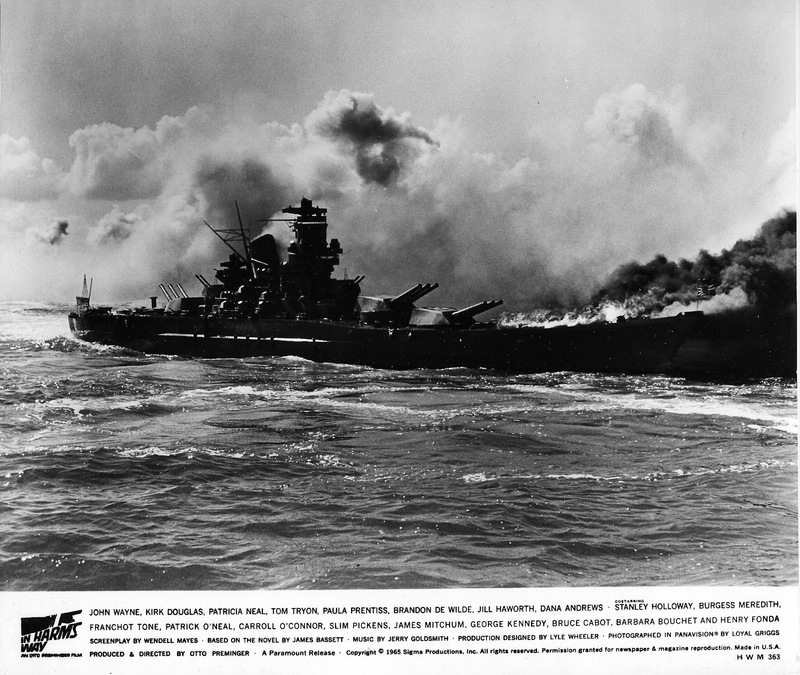 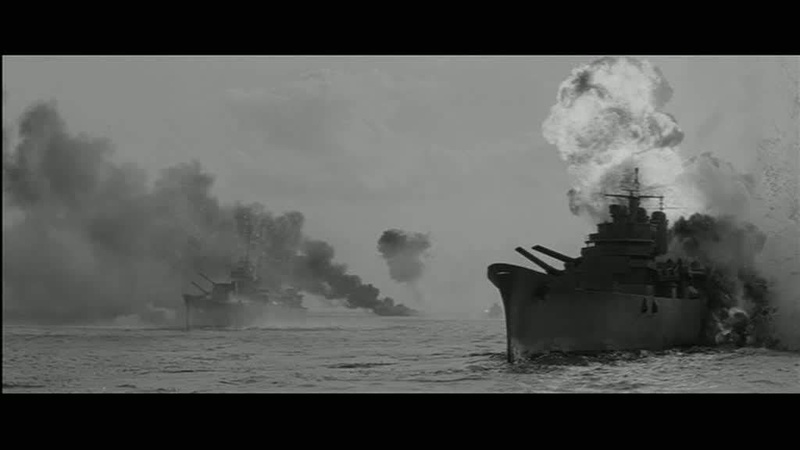 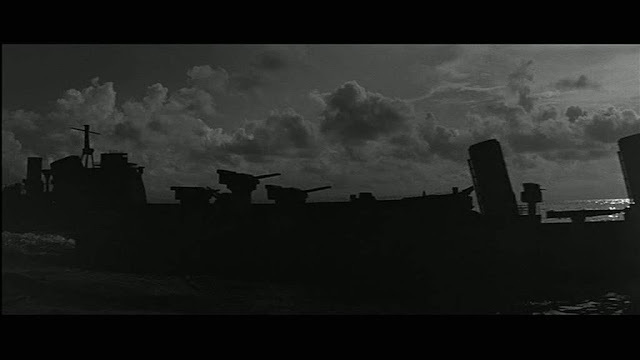 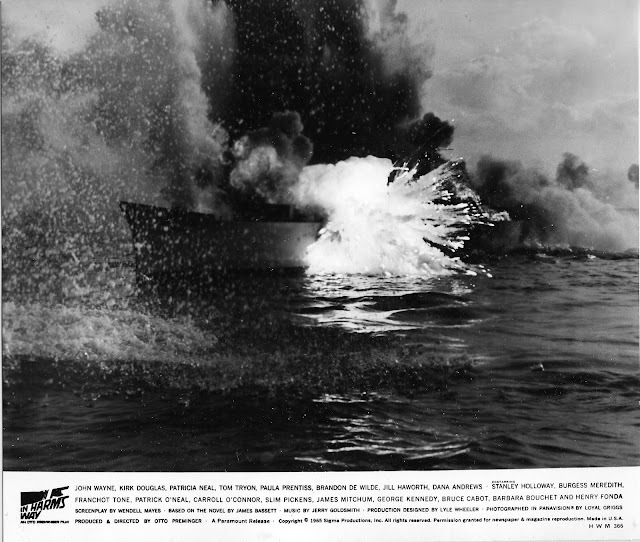 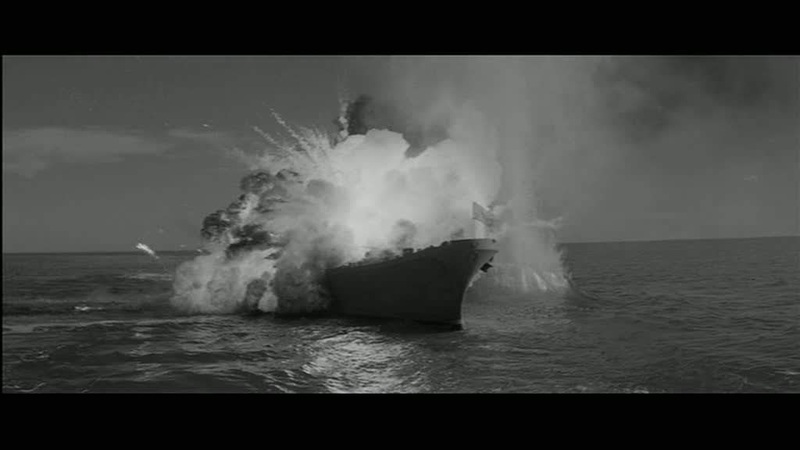 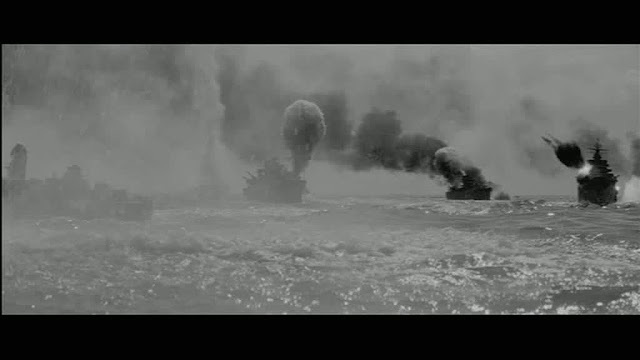 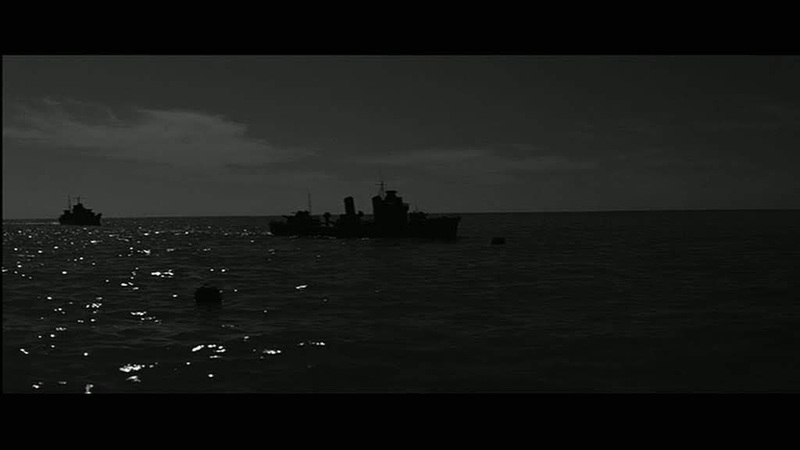 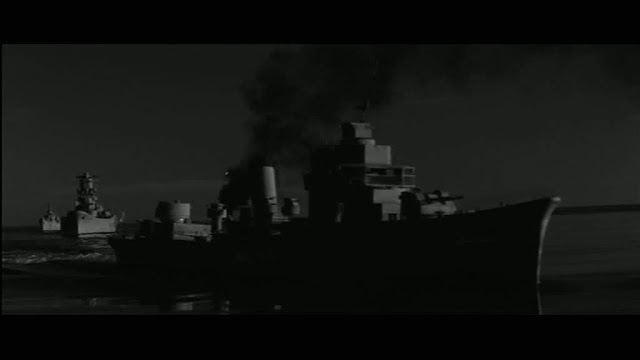 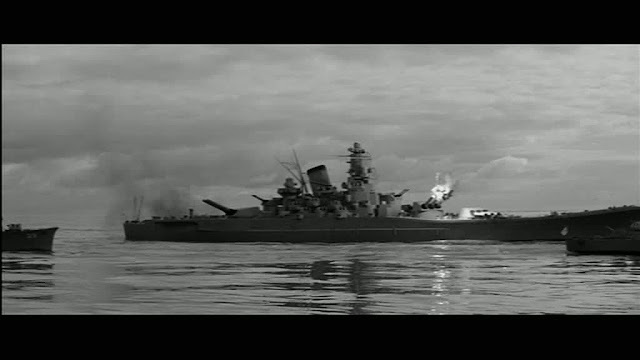 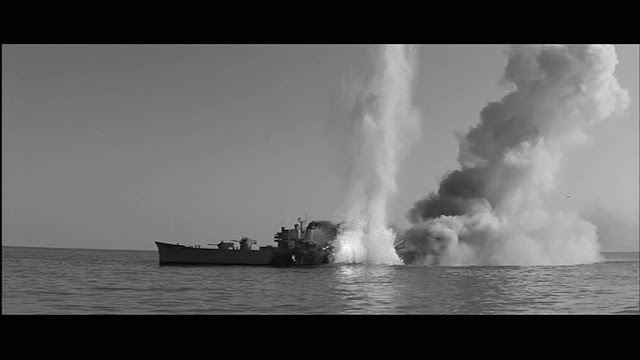 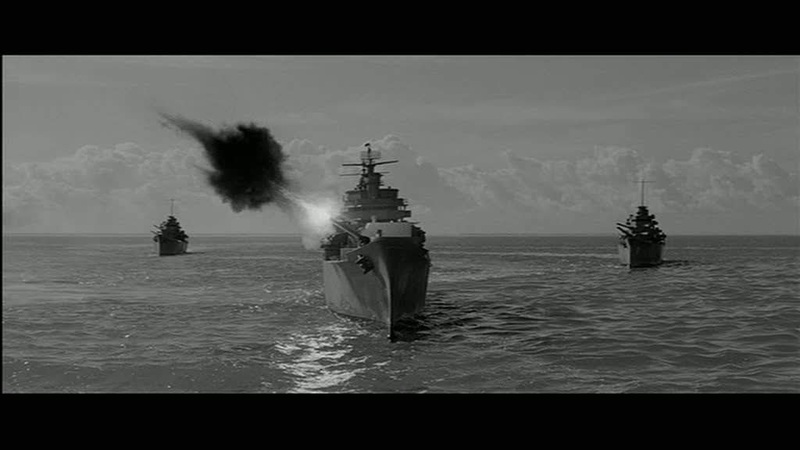 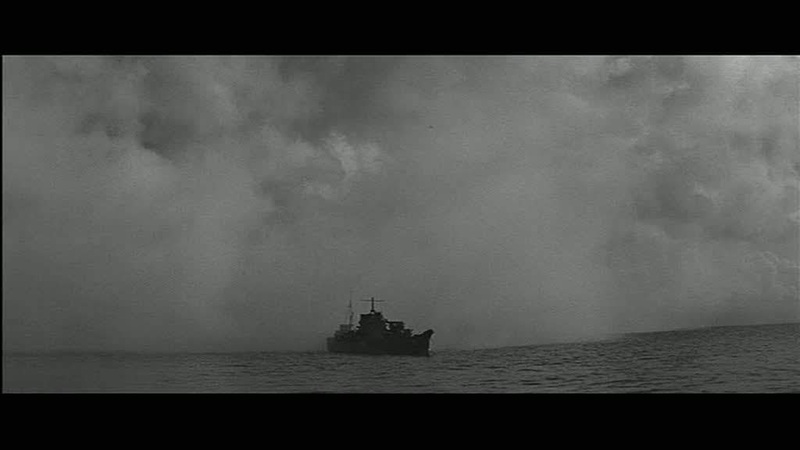 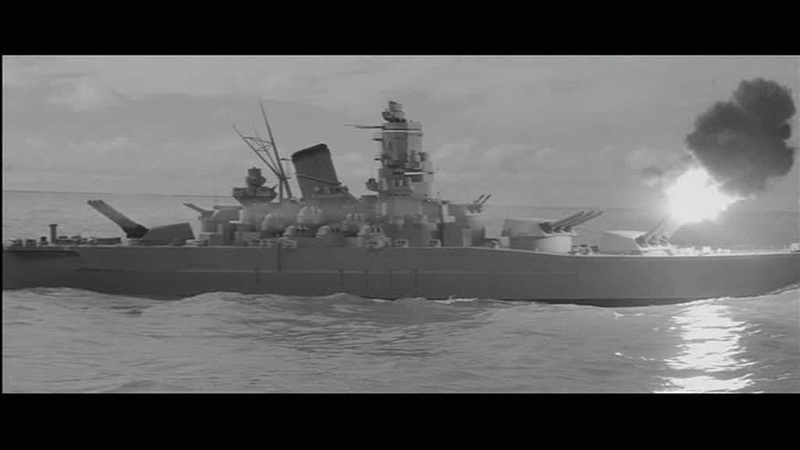 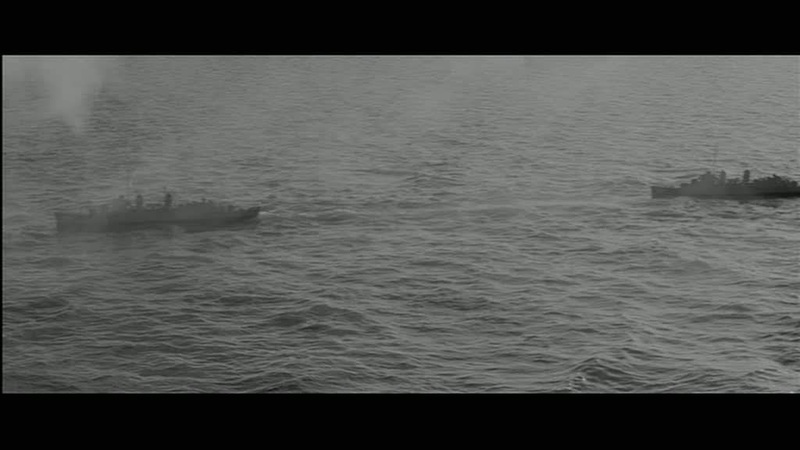 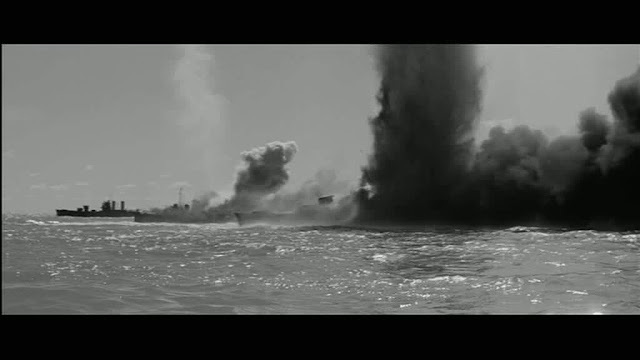 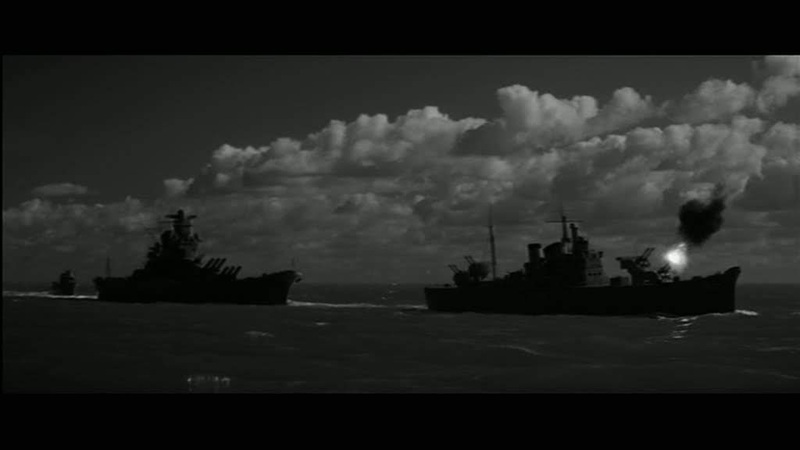 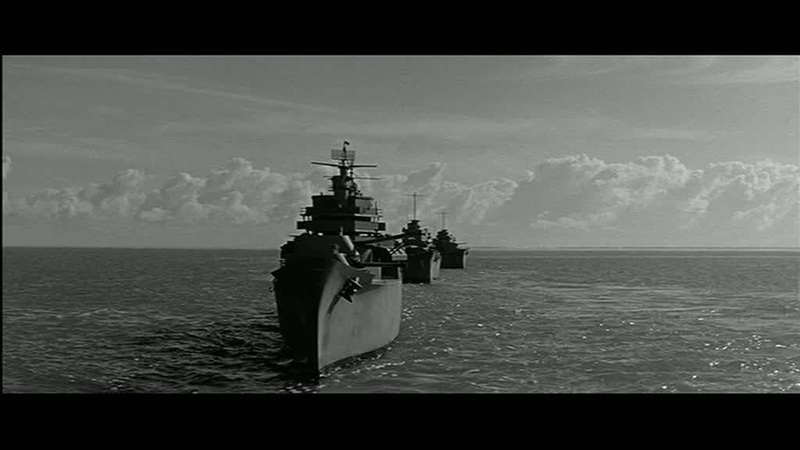 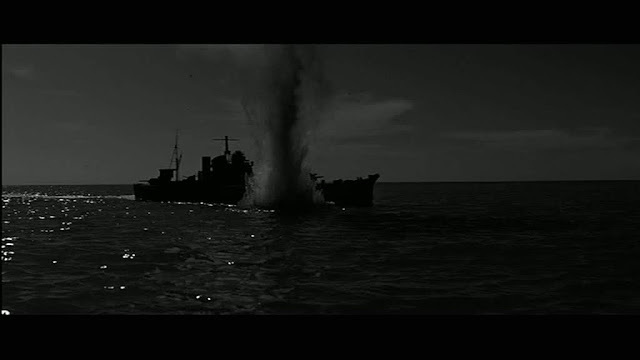 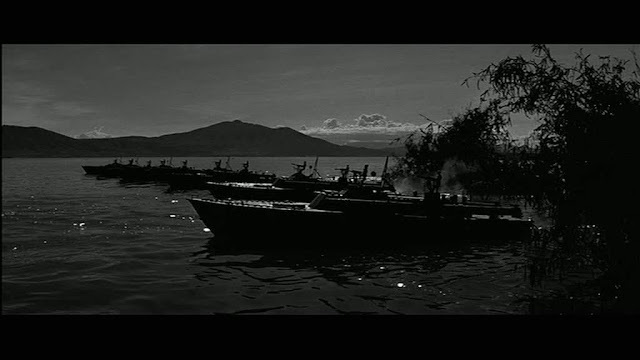 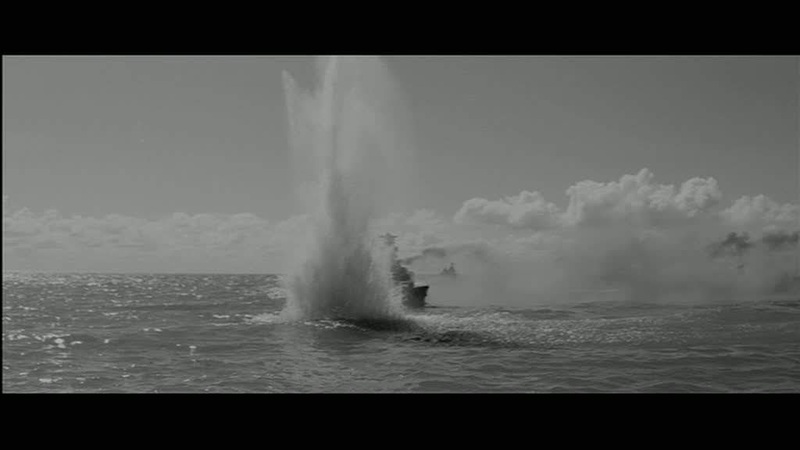 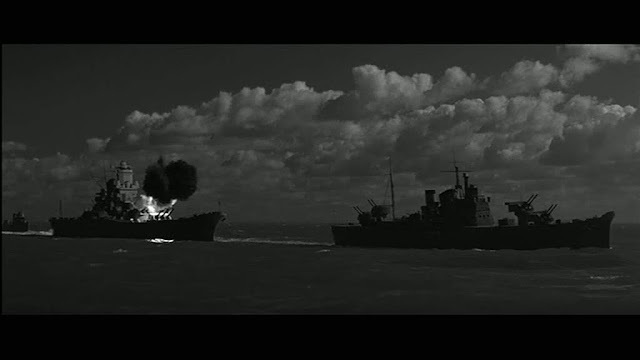 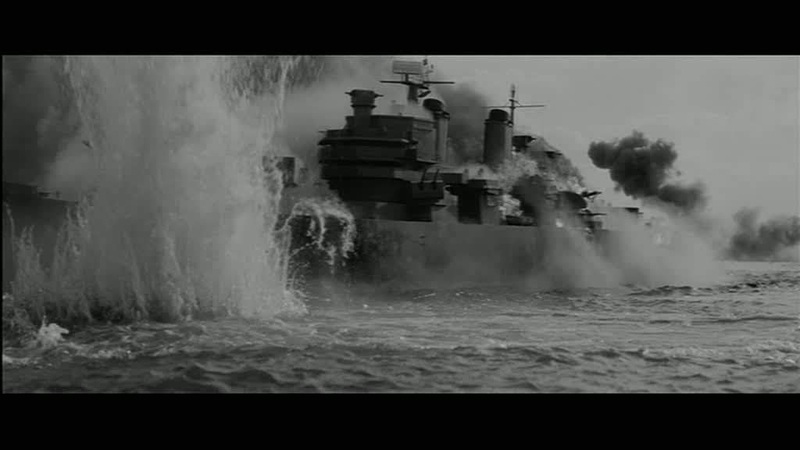 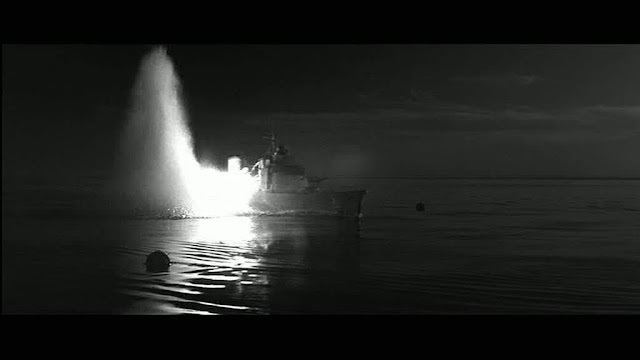 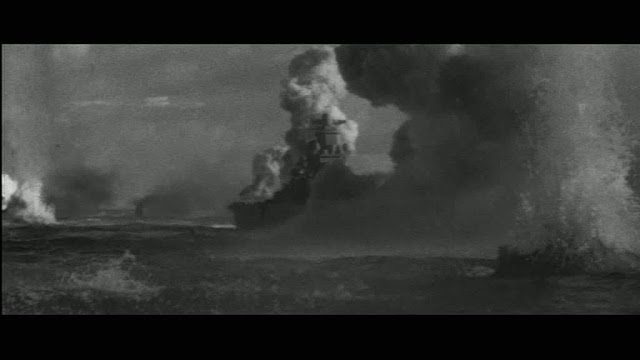 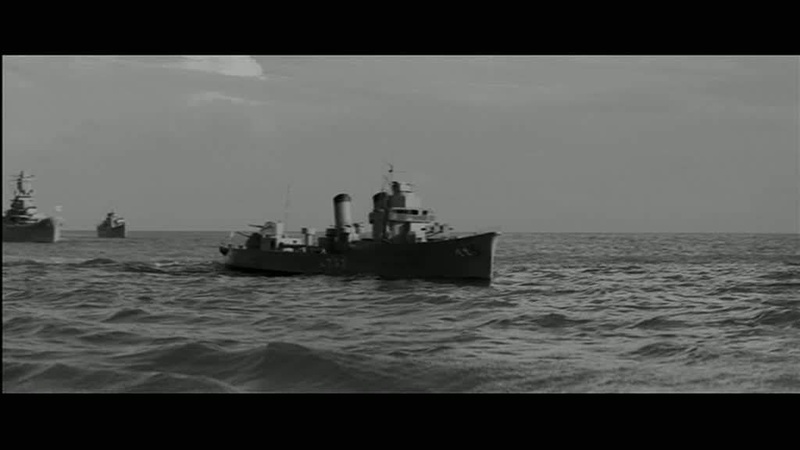 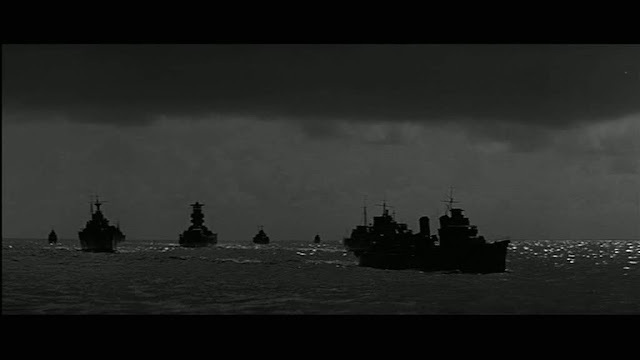 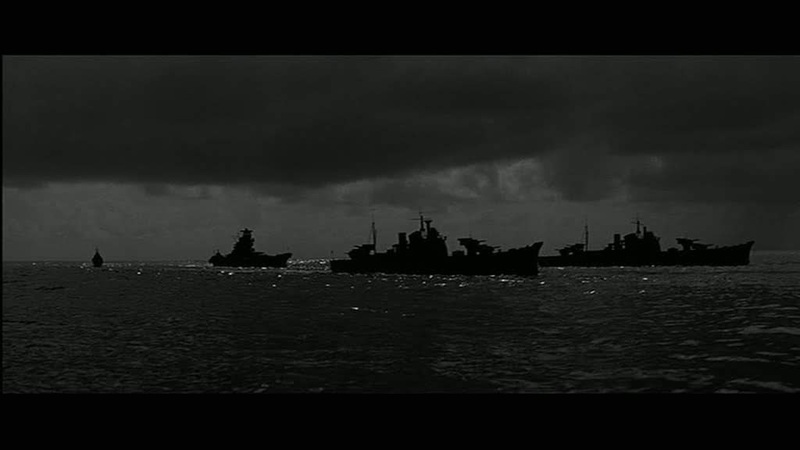 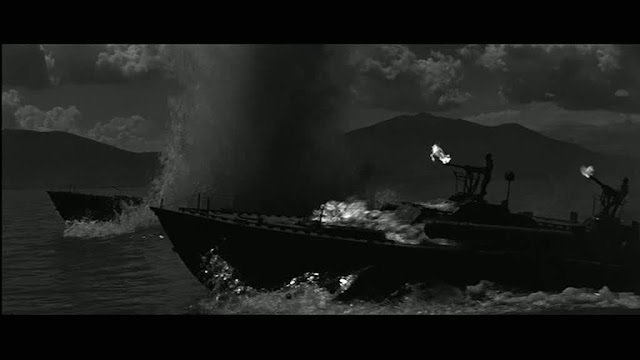 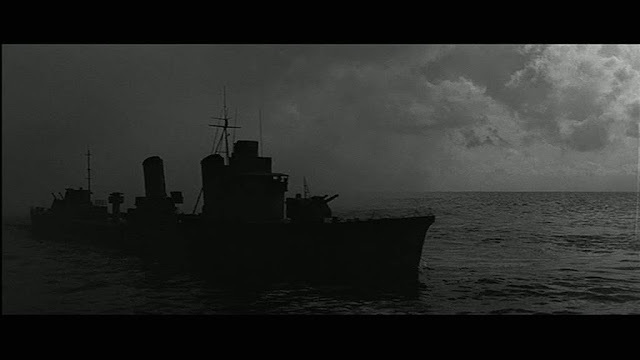 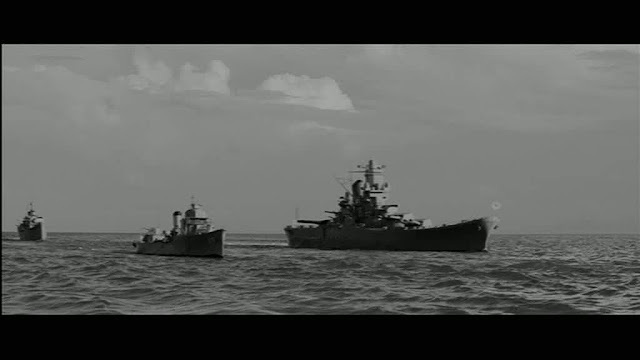 To prove that Lawrence W Butler was more than capable of producing quality model ship action after the criticism levelled at him by Otto Preminger on In Harms Way, here's a look back to an earlier film he supervised with a really spectacular ship in a typhoon sequence in the well crafted movie starring Humphrey Bogart, The Caine mutiny. 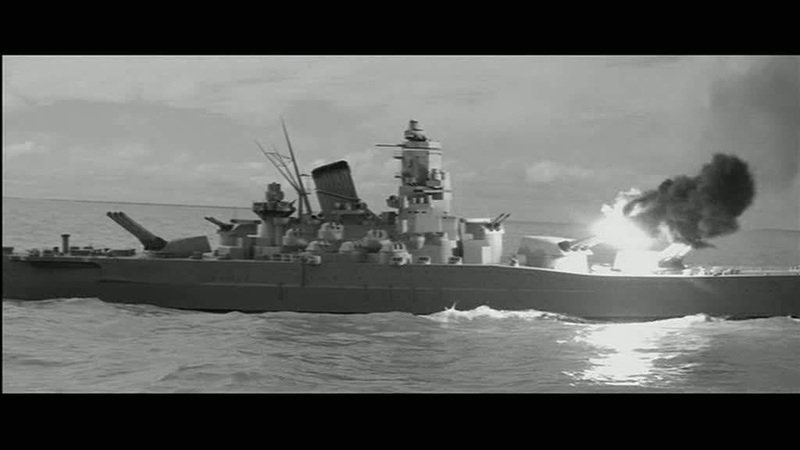 The model is really well detailed and realistically weathered and has a very effective funnel destruction shot where the metal skin is seen to crush in a convincing way. 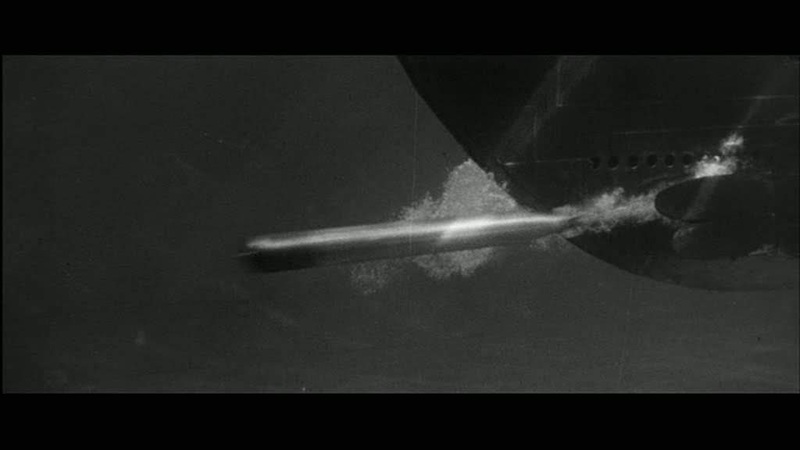 The frame grabs don't really show the hammering the model is receiving from the dump tanks and wind machines. 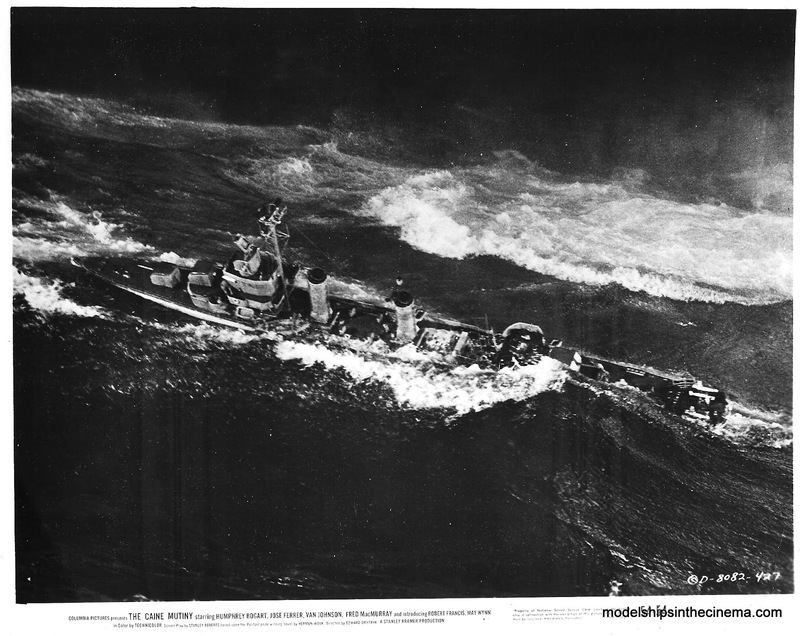 "I had originally hired a famous expert for these models. 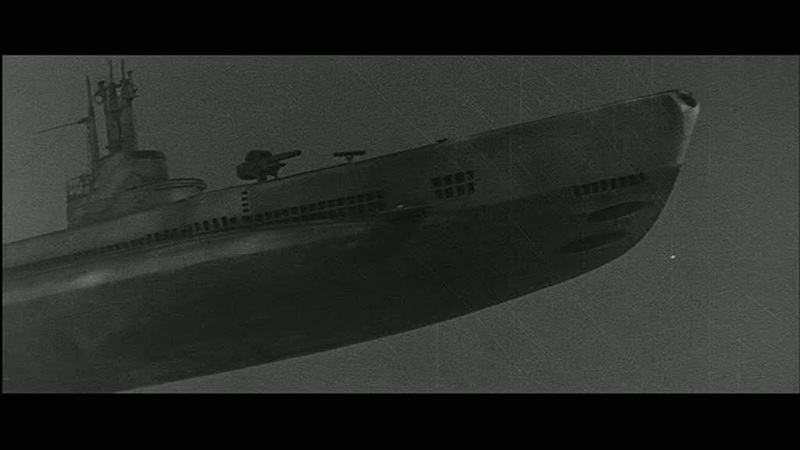 You know, they usually make them with ships about two to three feet long. 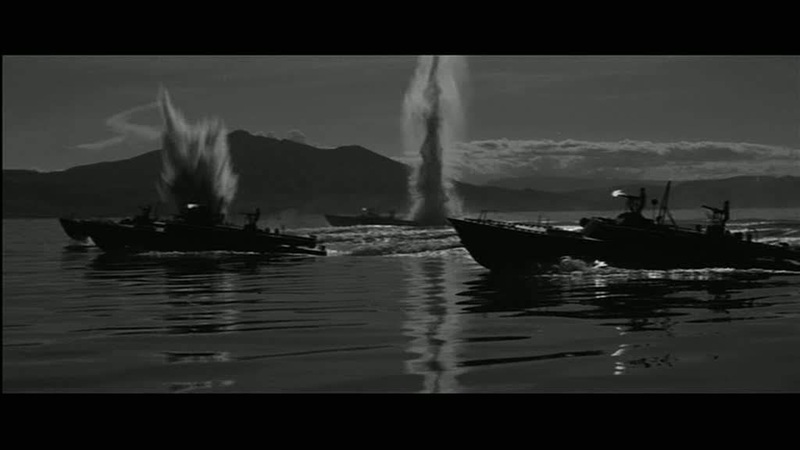 When I saw the beginning of his work, which was quite expensive, I threw the whole thing away because it didn't seem to be right. 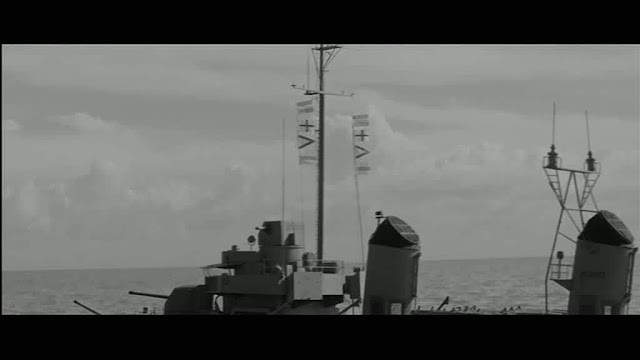 And then I proceeded to build ships. 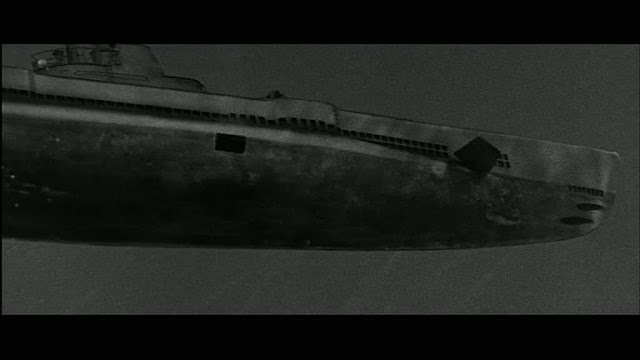 I did it myself after the picture was finished. 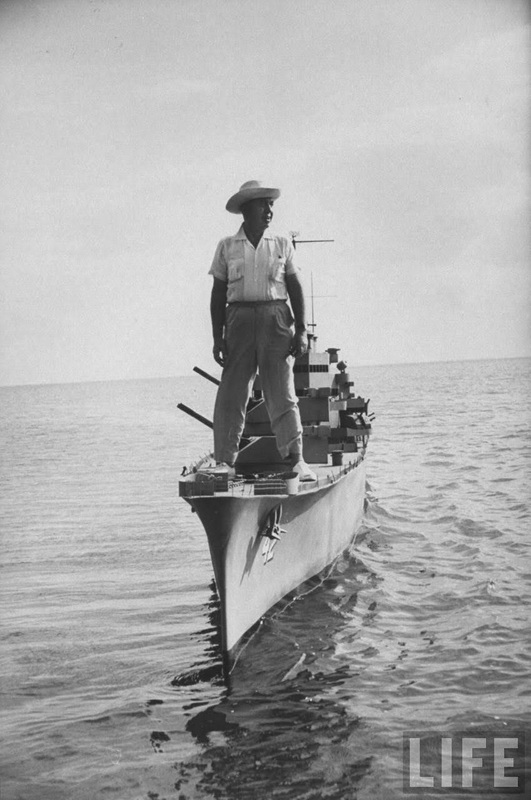 I decided to direct myself without any specialists, and we built ships that were 35 to 55 feet long so that when we photographed them the detail was very much like on the big ships. 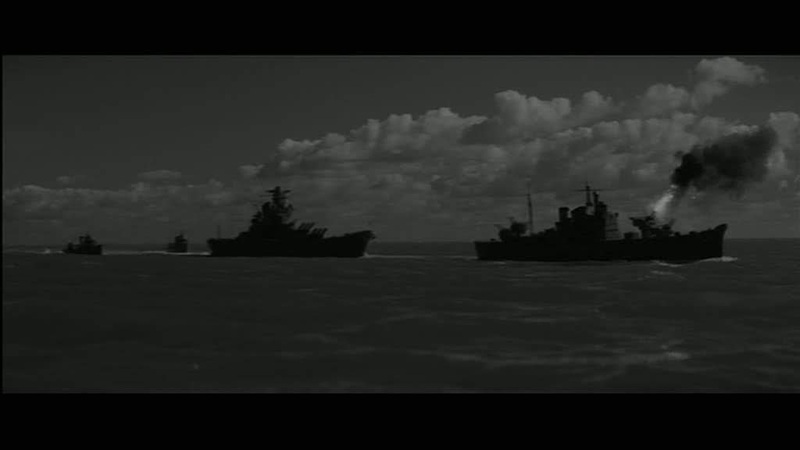 And we didn't shoot any of these miniatures in a tank. We shot the night miniatures on a lake in Mexico, because we needed the straits with mountains in the background. 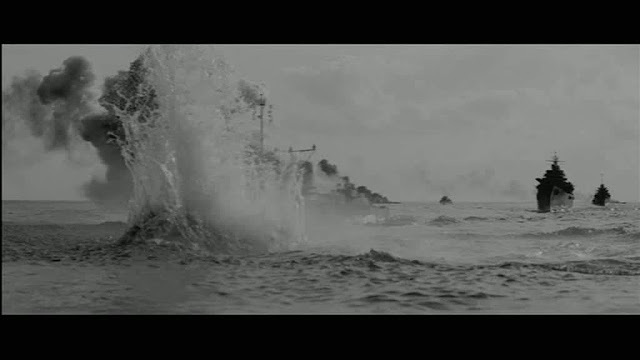 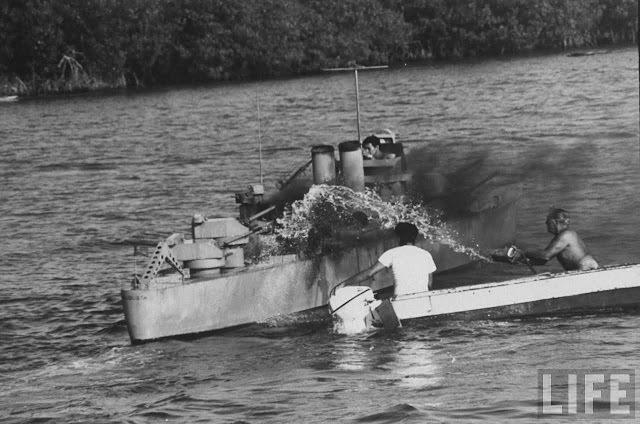 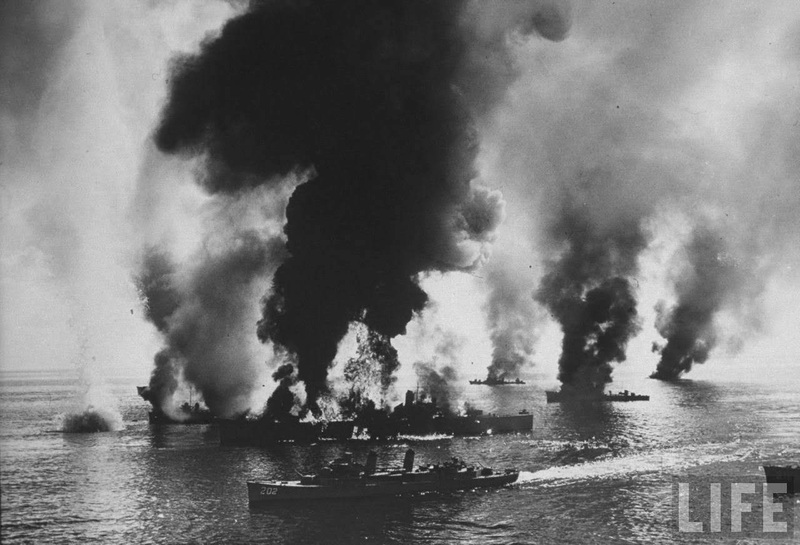 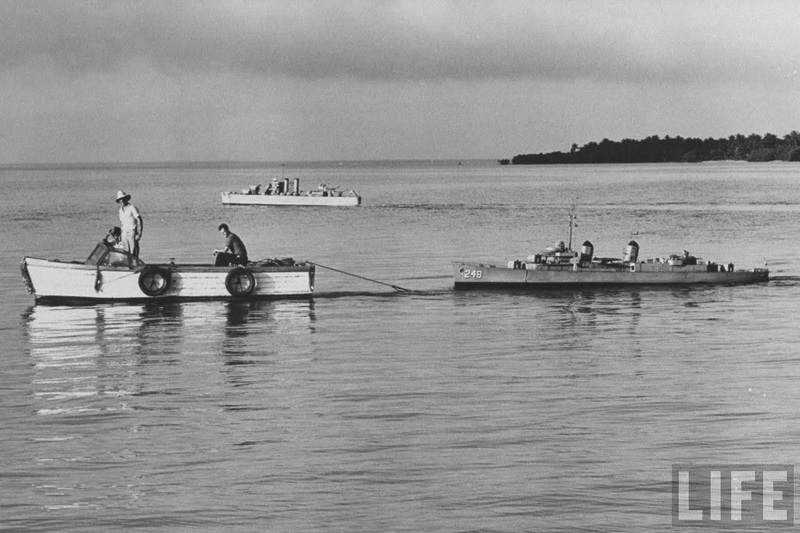 We shot the day battles in the gulf of Mexico. I needed a real horizon, you know, and I think that makes a lot of difference." 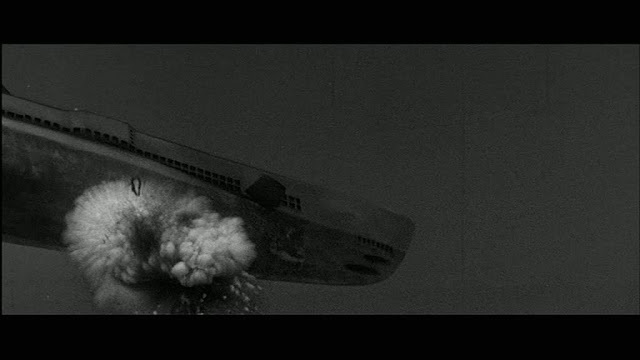 As John Brosnan points out the "expert" in question and the supervisor credited on the film is Laurence Butler a man of very great experience in the visual effects field in general and in the filming of model ship sequences, having many previous credits to prove it. He would be highly unlikely to be employing " 2 or 3 foot long models" and this seems somewhat of an exaggeration to make for good copy. 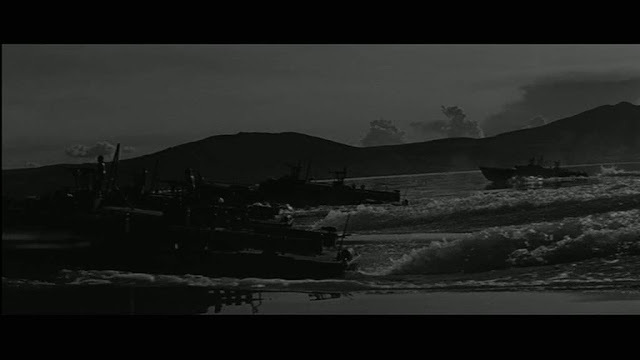 An article on TCM attributes John Wayne complaining to the director about the poor quality of the miniatures. 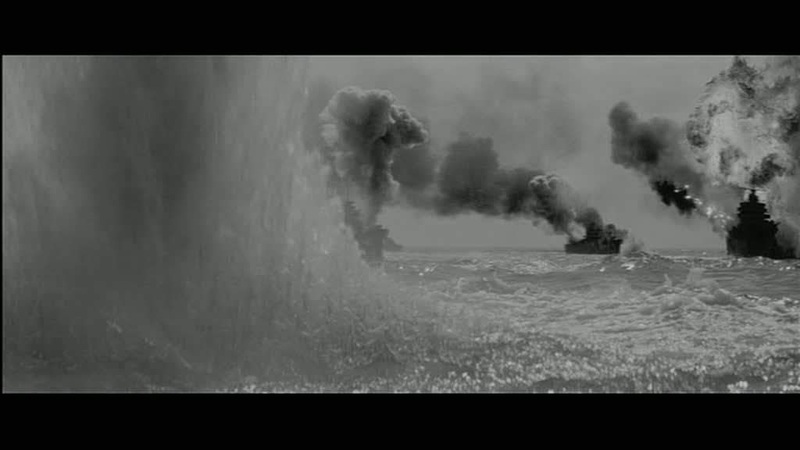 Wikipedia mentions that Kirk Douglas was unhappy with the miniature work and offered to get the visual effects people involved with Paths of Glory to do a better job at his expense. 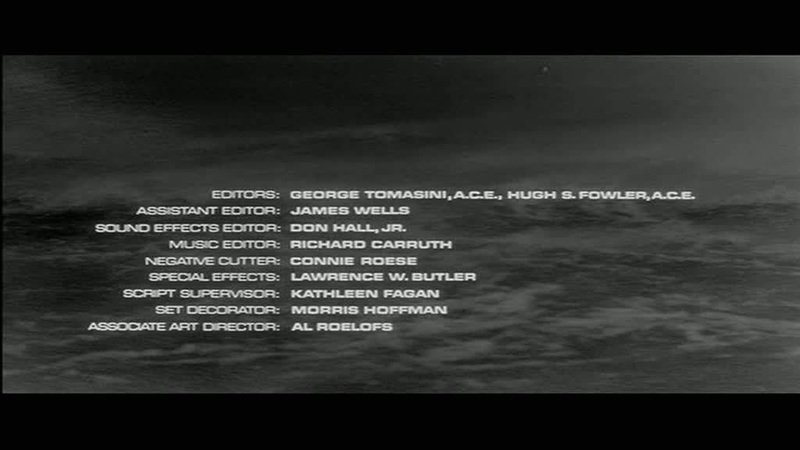 This seems a rather odd claim as there is no miniature work (as far as I know) in Paths of Glory at all. 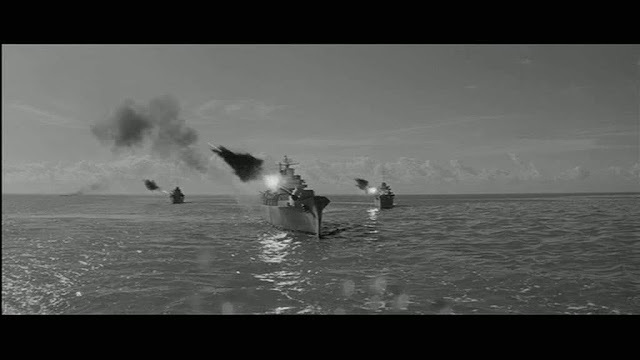 What ever the truth, the fact is that in many films with visual effects there are some scenes that work really well and some that don't quite meet the mark. For the most part who ever was responsible for the miniature work in the finished film, did a pretty decent job. 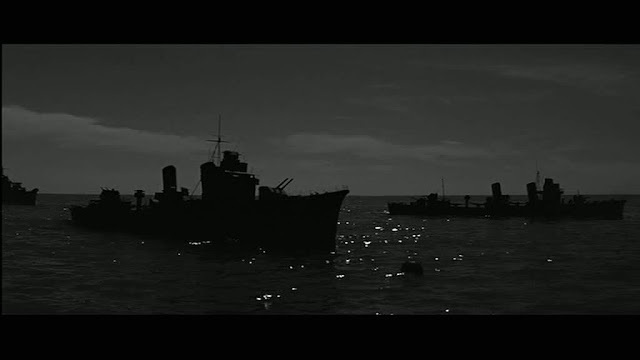 The real horizon certainly helps and the miniatures work very well particularly in the day for night scenes when they are mostly silhouettes. 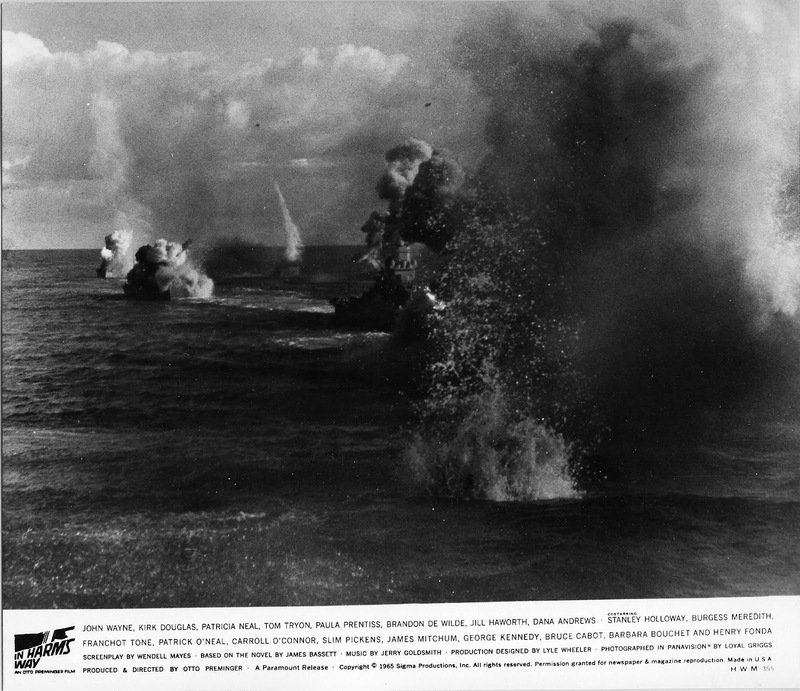 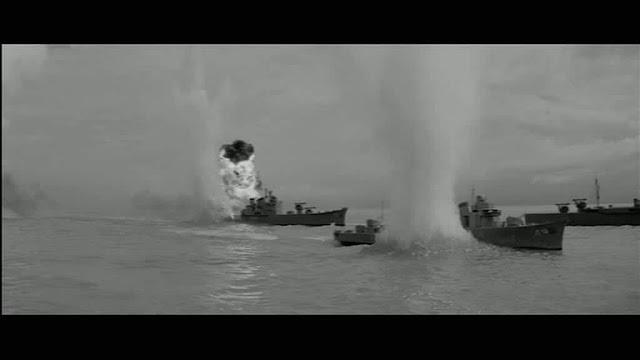 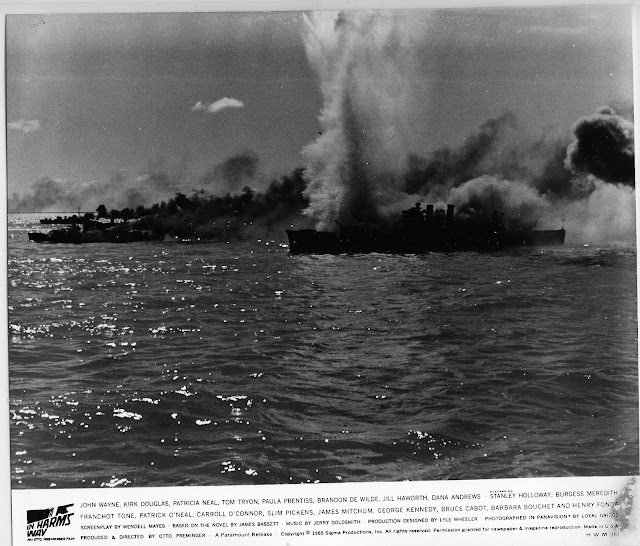 The most outstanding aspect is the sheer number and size of the explosions peppered throughout the miniature ships, there is a real sense of chaos, though sometimes it is hard to follow who is firing and who is getting hit. The one thing the miniatures lack is a weathering of all the painted surfaces, they all appear too smooth and clean to be convincing. The lack of the slight puckering concavity of the hull plates that you see on full size ships where all the frames, bulkheads and stringers leave their mark on the outer hull surface, is a bit of a giveaway in model ships. 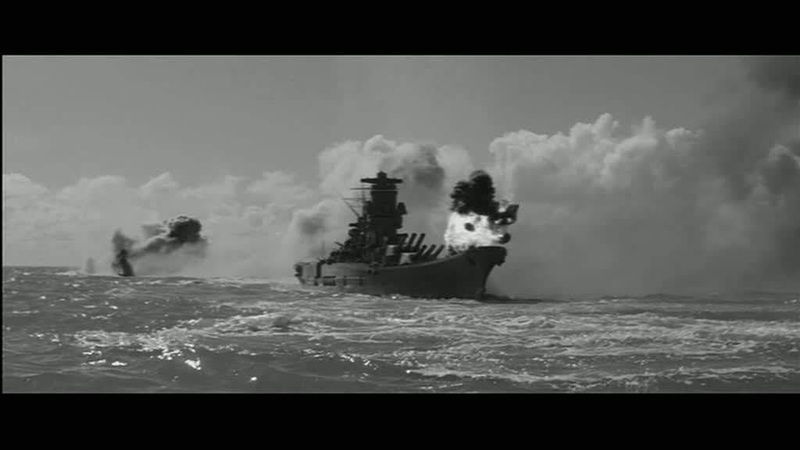 Granted that is a very difficult detail to model but it can be simulated with painting the effect of the shading you get across the surface. 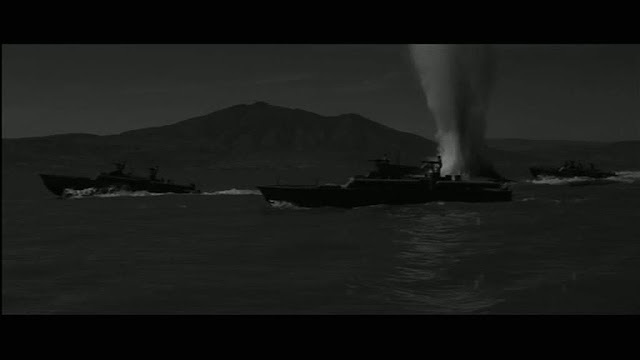 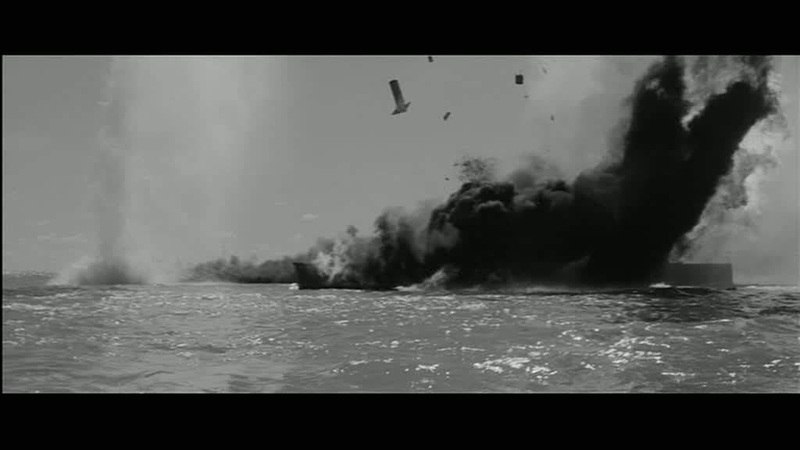 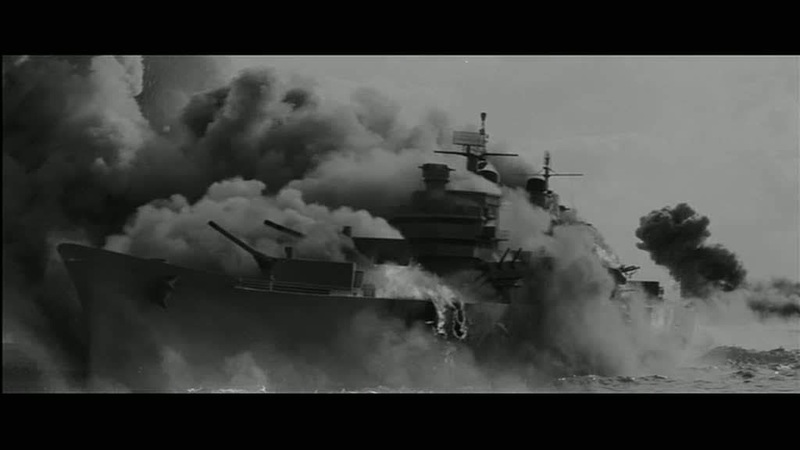 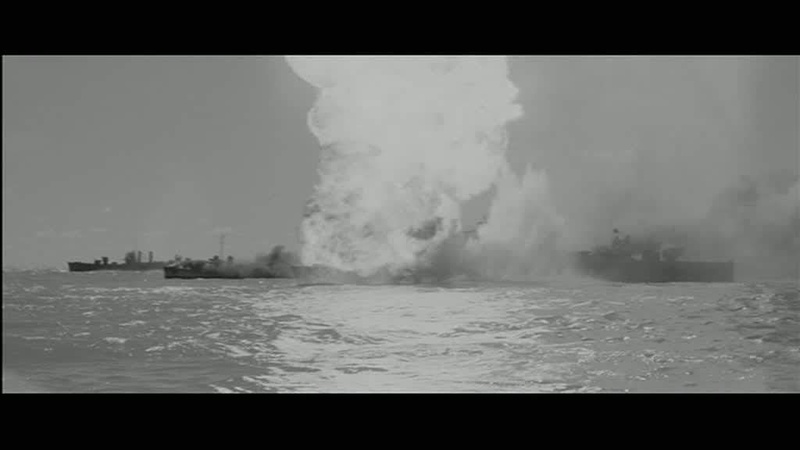 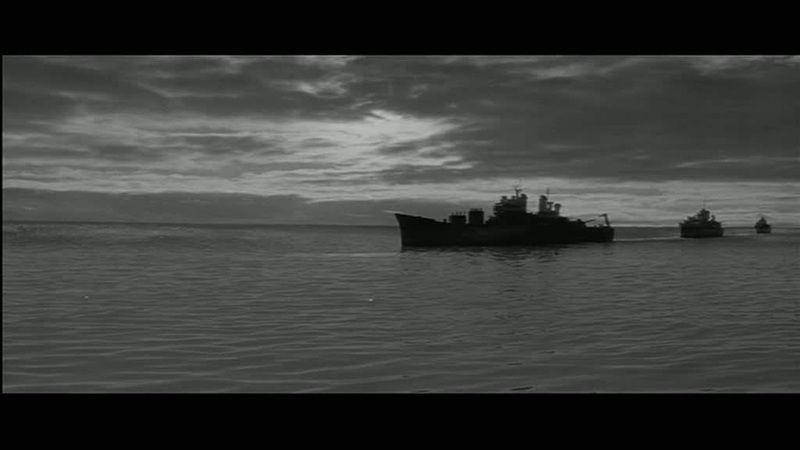 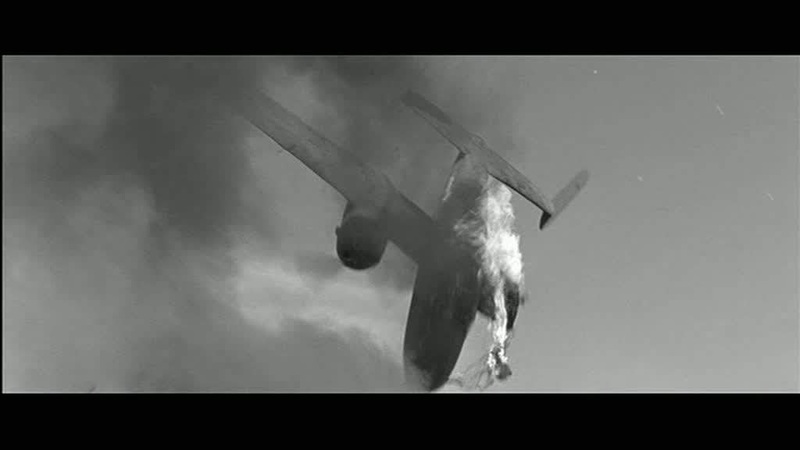 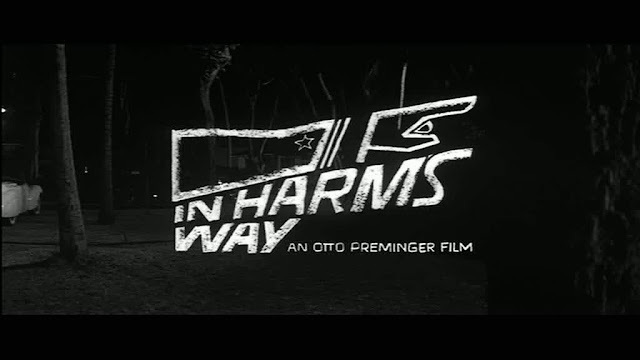 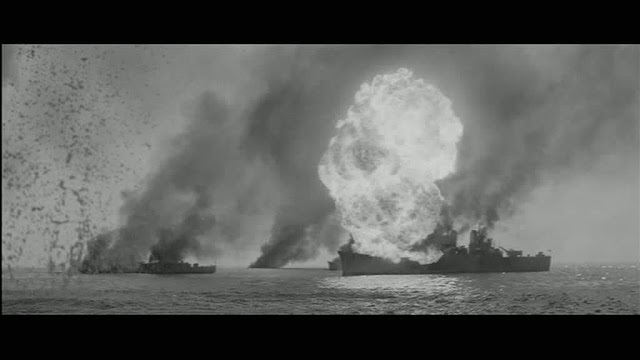 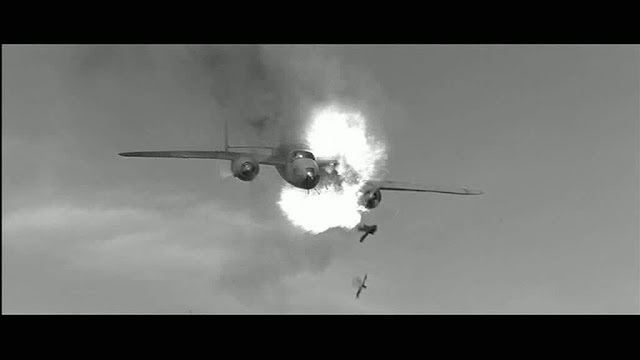 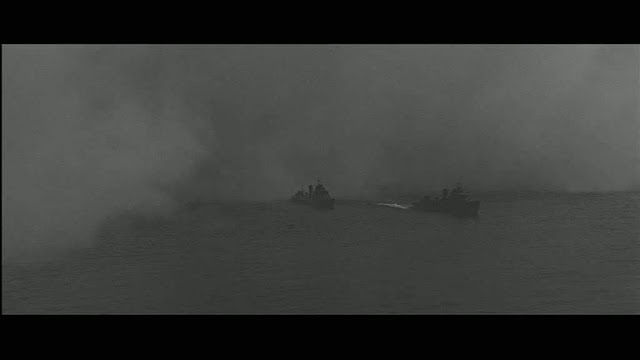 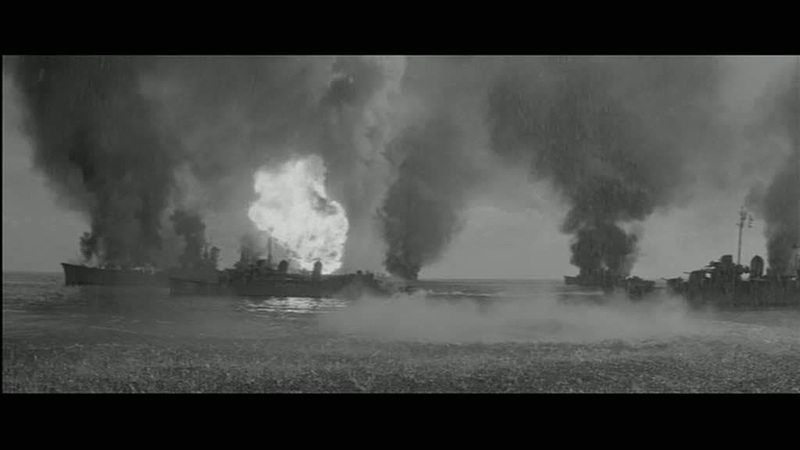 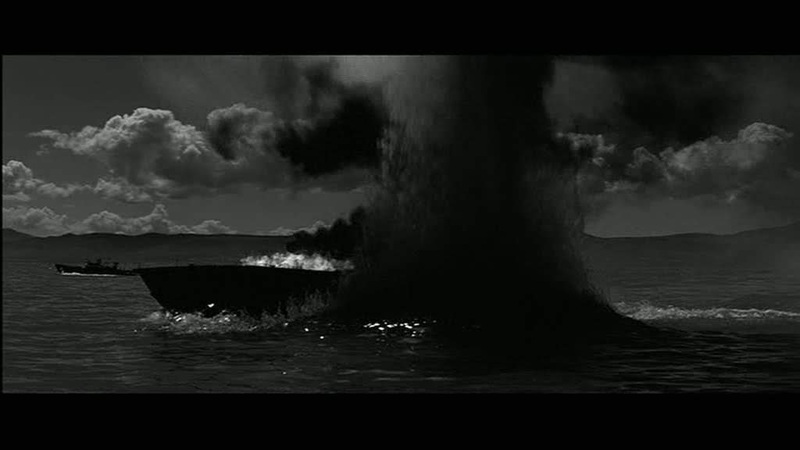 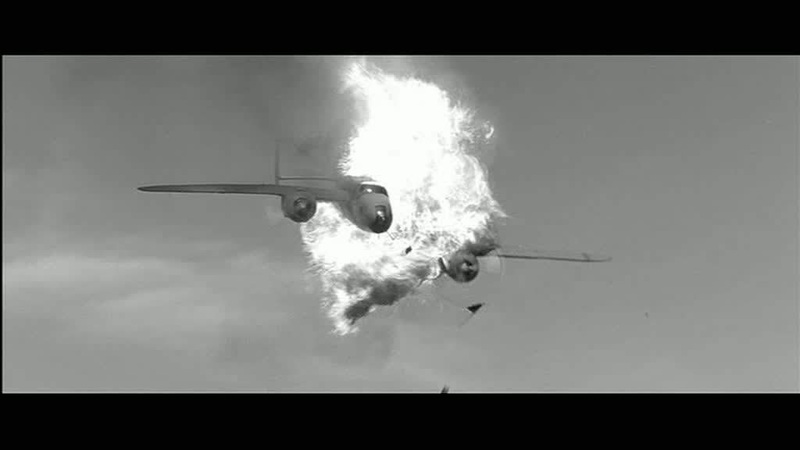 In Harms way was one of the first Hollywood films to have its credit sequence at the end of the picture rather than at the beginning as was the usual practice at the time.